I'm so sorry I've been missing for so long. I just wanted to stop back on and let you know that I've decided to stop blogging & will no longer be doing design work. I have some areas of my life that I want to focus on, and as you know, blogging and stamping require a lot of my time and attention, which I don't feel like I have right now! I personally want to thank all of the wonderful stamp companies who have put their faith in my stamping abilities and have shared their incredible products with me. Most of all, I want to thank you, my faithful readers, for always being here to support and encourage me through my paper journey. All good things must come to an end, and I feel like this is the perfect timing for me right now. Who knows, someday you may see me back, once I've gotten things in order and have more time to devote. 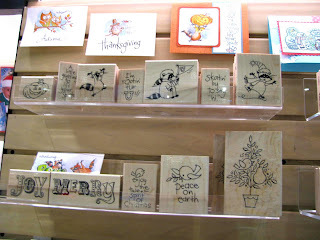 Maybe when I'm 80 and finally can retire (grrrrr), I'll be a stamping machine again! I wish everyone endless creativity and happiness! Hi everyone! Hope you had a great weekend! 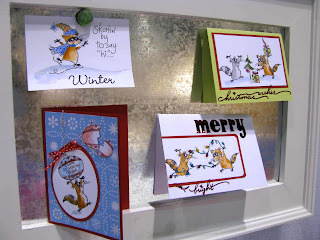 Today I'm posting those blurry Stampendous photos I promised...just when I thought the Changitos couldn't get any cuter, Stampendous goes and changes the game and introduces these sweet little funny RACCOONS! Oh I love them! 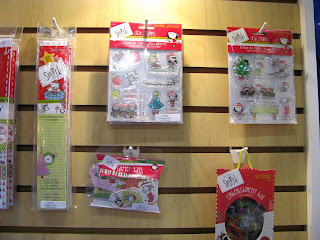 Look at the cute samples that were hanging up in the booth! Could they get any CUTER? 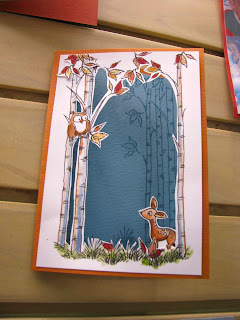 They also had a line of woodland stamps with these sweet little animals and tall birch trees! 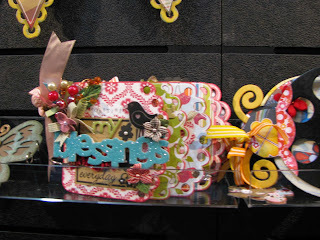 WAY TO GO, STAMPENDOUS! 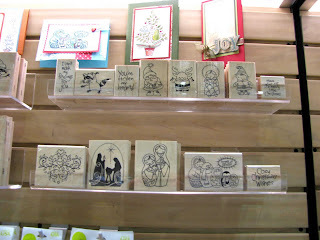 I also found this cute line of stamps by a new vendor called "Smirk"! Since these came out unbelievably blurry too, I thought I'd post a website where you can see them more clearly! Sorry for the bad photos, guys! Smirk Clear Stamps Link HERE. Oh man, I don't know WHAT setting I had my camera on when I was flying through the booths at CHA taking photos, but many of them are BLURRIER than a white squirrel in a snowstorm. Dang. At least I've never claimed to be good at photography, so you guys don't expect much at this point. 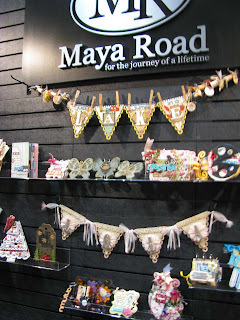 Maya Road BLEW me away with their chipboard albums, banners and vintage trims! 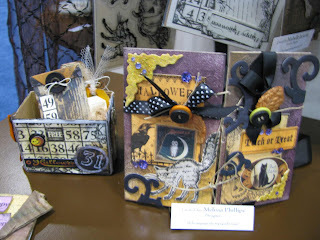 I wish I was a scrapbooker, because these albums are adorable. Oh well, at least with the blurry photography you get the full glitter effect when you click on the closeups! We need one of these for the cabin. Back with more tomorrow. 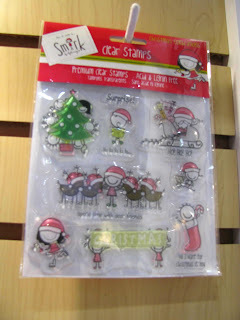 (Blurry Stampendous, anyone?) I'm a putz. Okay guys, I'm back from Orlando and finally have recovered enough to sit down and go through my CHA photos and pick favorites! 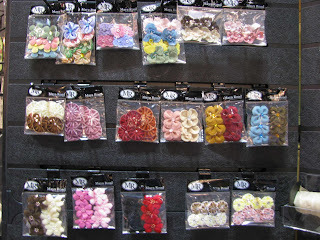 The retail part of the show was a complete success, and Crafty Secrets was a HUGE hit! Anything that was not nailed down in the booth sold QUICKLY! 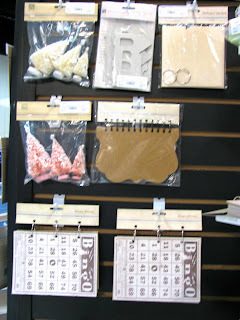 I hope this signals that the economy is recovering and people are happily going back about their business of stamping and scrapbooking! I thought tonite I'd show you some CHA eye candy. If you have been following the trends, you know that vintage is HOT right now! We had the pleasure of having a booth right across from Melissa Frances, and I got to meet her cute little survivor (breast cancer) self in person! Melissa's line got me STRAIGHT in the heart. 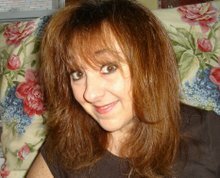 I WAS VERCLEMPT, I tell you, when I saw the cool BINGO cards she's selling! HEART PALPITATIONS! 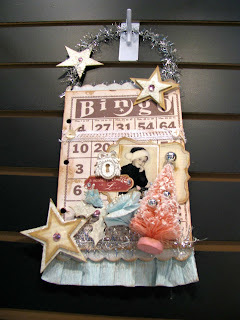 These cool bottle-brush xmas trees that she had on the bingo card came in soft pink and cream! SO YUMMY! 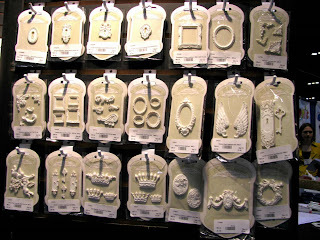 Cool vintagey hardware for your projects, in shabby white...be STILL my heart! Okay, enough gushing over Melissa. On to Making Memories. 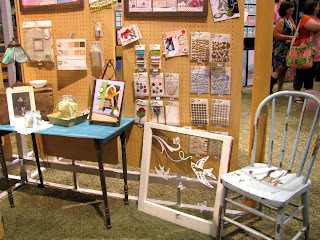 The Making Memories booth resembled a cool, old-timey sewing goods shop! I had heart palpitations here, too! Check out the chippy paint on this chair. Heaven, I tell ya! 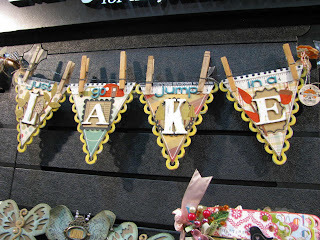 Enjoy peeks at the vintage findings! MM has always carried vintagey-looking lines, but this one blew me away! So much yumminess! Back with more tomorrow ! 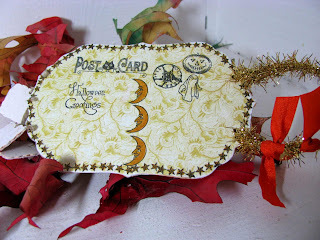 Tonite I'm posting the last of my Crafty Secrets Halloween postcards, that will debut at CHA next week. I hope that you all will be in Orlando for the consumer part of the show! I'll be doing a make and take with these little postcards at the Splitcoast booth from 9-11am on Saturday at the show, so if you want to come and play, I'd LOVE to see you there! 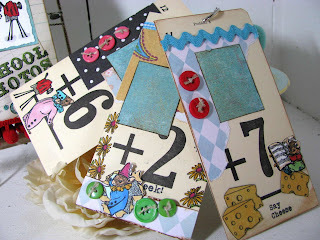 I think Sandy already showed these on the Crafty blog, so you may have already seen them. But I thought I'd post them here for those that didn't link over. 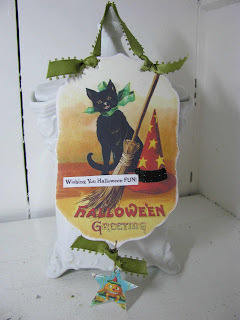 I love how vintage Halloween decorations always have some form of fine antique glass glitter on them, so I decided to add glitter around the edges of the postcards for sparkle. 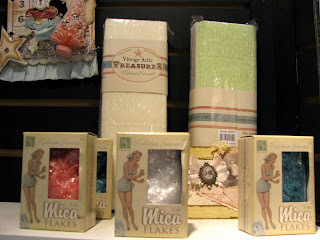 I always use the Martha Stewart glitter from Michael's; it truly gives a vintage look to everything. Here's the back of the postcard. 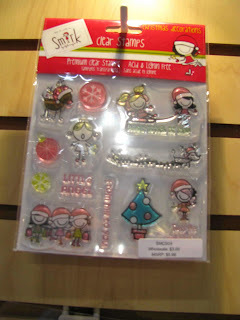 Each kit comes with little postmark stamps and fun little seasonal images to color in! For this cat image, I attached a chipboard star so that it dangles from the bottom of the postcard. 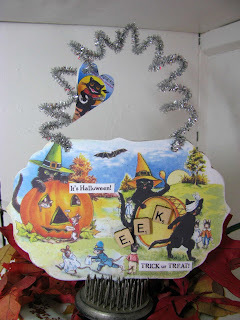 The image sheets come with fun Halloween words that work great for doing collage on the front! So I'm off to CHA, so I'll be missing in action for a week in Orlando. Hope to see you there! Hey everyone! Can you believe it, 2 posts in one week for me! And I'm aiming for a third also! How lame am I? LOL! My family was shopping in one of our favorite boutique stores and saw a sign that said "Go sell CRAZY somewhere else, we're all stocked up here!". That pretty much sums up my life lately. I'm in prep-mode for CHA, and since I've done CHA for the last few years, my feet are already screaming, thinking about the trauma of standing for days on bad shoes. I thought I'd try to plan ahead this time and find some cute, comfy shoes that won't make my feet scream. Unfortunately, I wear a size 5, which is not plentiful, if shoe companies make them at all. So I ended up with these Clarks "Navan" casual sandals, and got them 1/2 off! We'll see if they work; I usually end up in flip flops on like, DAY 2. WHY don't they make cute shoes with like an inch of padding in them for trade shows? LOL! Okay, so you could care less about my shoes, lets get to the goodies, right? 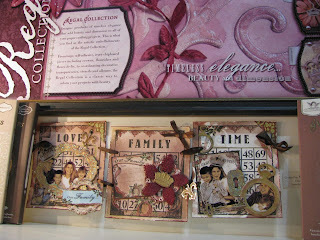 This is one of the new Postcard Kits that Crafty Secrets will debut next week. I played with some of the Xmas themed ones; I decided I'm having more fun making them into decorative hangings, vs. actually sending a postcard! 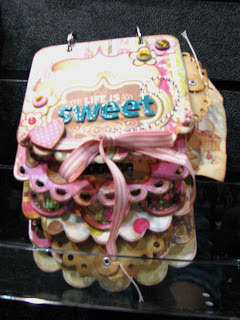 I glued a glittered chipboard swirl to the bottom of this one, then hung the chipboard images to the swirl with wire! 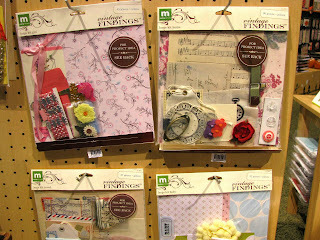 All of these cute little images and heart shaped chipboard come with the kit! Here's another snowman image from the kit. I used my chipboard swirls again and glued it to the front to get some dimension, then added a chipboard star on top of the swirl. 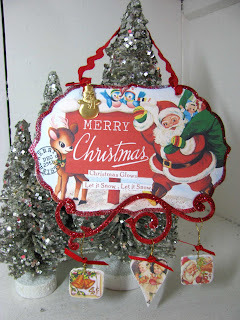 I took clear glitter and glittered some of the snow on the hanging, so everything is sparkly. I know you actually can send these in the mail, I think you'd just want to not add the extra layers and try to keep things flat. My sister already called dibs on the first image, she wants to use it for xmas decorations, so I guess mailing it is a moot point anyway! 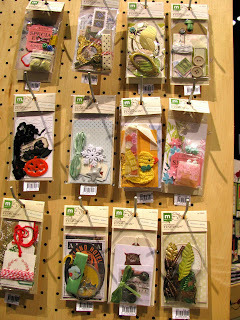 Don't forget to go to the Crafty Blog and enter the give-away for postcard kits HERE! Hope you're having a good week, everyone! Morning everyone! 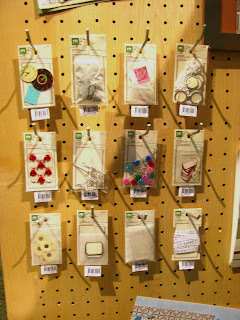 I'm sneaking in an early post because we can now show you a new product that Crafty Secrets is debuting at CHA next week! 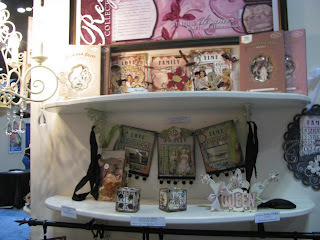 Sandy came up with cool vintage postcard kits that you can create postcards with, or doorknob hangings, or mini albums, or garlands! 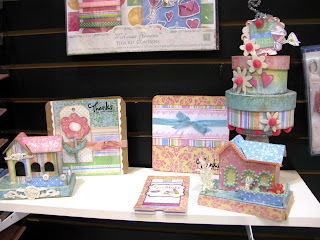 The design team girlies have been busy all weekend creating postcards, so stop by and check them out on the Crafty Blog HERE! I'm amazed at the creativity that this design team cranks out~ every single one has unique and fun details! 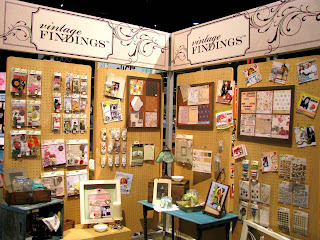 I've been having so much fun playing with the kits & making samples for the trade show booth; I'll have more samples to show you all week! I lucked out and got a ton of the Halloween images (MY FAVE!) For this one, I cut out some of the typed words that came on the image sheets to add a sentiment to the front. 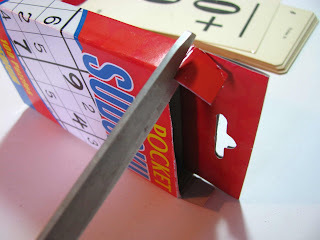 The little wooden scrabble letters are old, but come on a sheet and are self-adhesive. I used them to spell 'eek' out on the front of my postcard. I also used silver pipecleaners for the handle on this hanging; I just wound 2 pipecleaners together and then spiraled them around my finger to get the corkscrews. 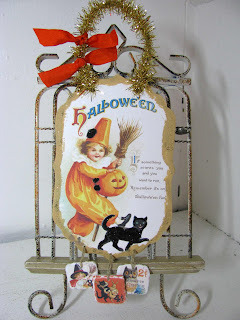 For this little hanging, I used some gold wired tinsel I had from Christmas trims, and added orange bows to the top. 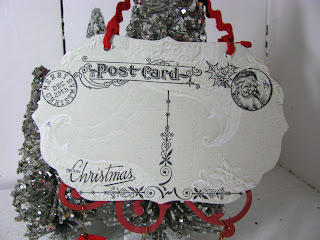 I also used Tim Holtz Linen crackle paint to paint the edges of the postcard, and sprinkled in a little black glitter for shimmer. I also used black glitter on the pompoms, and the cat's body. The kits come with little stamps that you can use to stamp the postcard back. 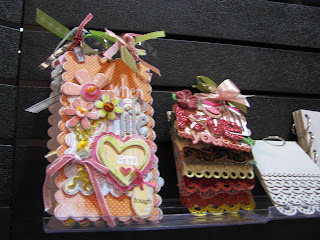 All of the little chipboard embellishments come with the kit, like these little 2.cent stamp images hanging off the bottom. I hope you'll all be in Orlando next week, I'd LOVE to show these off to you in person! 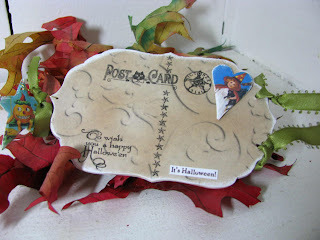 I'll have more of my creations this week, but in the meantime, make sure to stop by the Crafty Blog, as they are doing a give-away for postcard kits! Marnin, all! 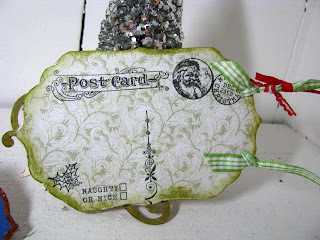 I'm back and I'm a stamping machine this week! 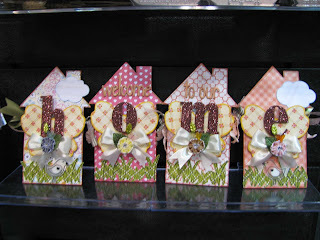 I got one of the new release CHA Crafty Secrets stamp sets in the mail, and finally had a chance to play with it! Too bad I had to get sick to get some much-needed time in my stamp room! I'm a snotty, hacking mess right now, but hey, I STAMPED! 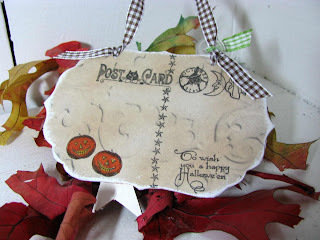 I gotta tell you, it was a challenge to get into fall mode with Thanksgiving stamps in JULY, but I got-r-done! Except the colors on this card don't seem very thanksgiving-ish, do they? 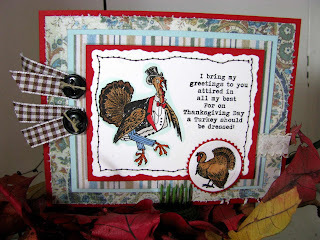 This cool turkey-guy is from a new release Crafty Secrets Thanksgiving set. 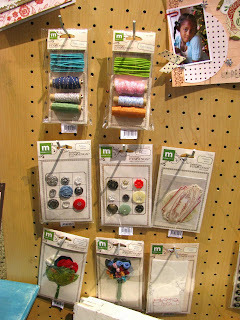 Crafty has lots of fun stuff coming out for fall, and a NEW product, on top of it all! 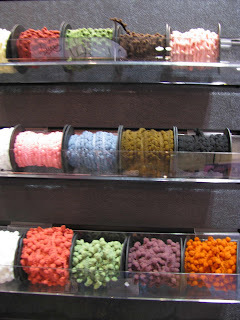 The design team is working on samples right now and when we get the go-ahead, we'll show you peeks of the new stuff! 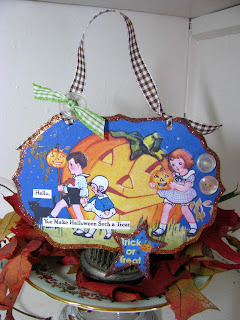 Sandy always finds such fun sentiments to pair up with her cool vintage images. 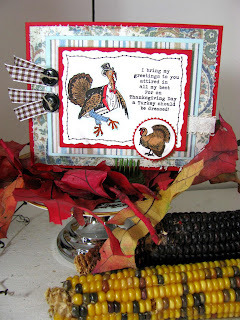 Check out the closeup of this one to see the cute little greeting for the turkey! I used a Spellbinders deckle-edge nestabilities die to cut out my main image, then took my sewing machine and sewed a little 'deckle' edged border with black thread. I think it turned out kind of whimsical! 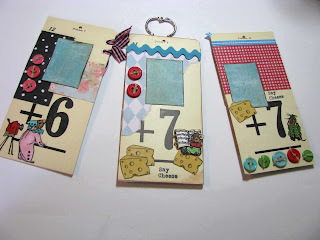 I'll have more sneak peeks for you with this set, but in the meantime, check out the other design team girlies blogs; I know sweet Pam Hooten has some yummy eye candy already on hers! Happy weekend, everyone! Hi everyone! Not much new to report on the stamping front here. 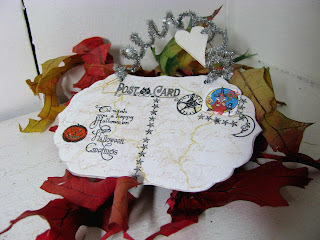 Still running around like a chicken, and still no stamping this week! 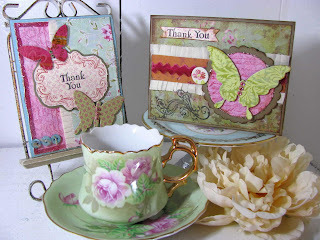 I did find some shabby butterfly cards that I did at the cabin a few weeks ago and forgot to post. 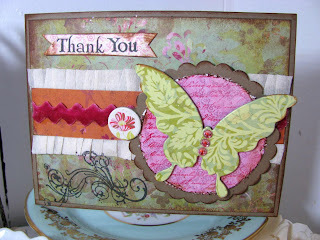 These were more quick cards done with some shabby K & Company papers and chipboard butterflies. I added rhinestones to the butterfly bodies to bling the cards up a bit. There's shimmery glitter on the butterfly wings too, that I added for effect. 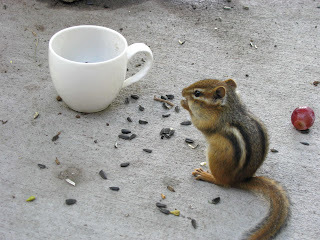 I thought I'd post these shamelessly cute chipmunk photos from the cabin over the 4th, too! These little guys are so tame, they've run over our feet if we happen to get in their way. 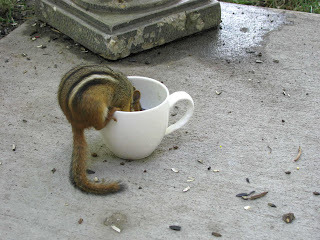 I grabbed my camera and a coffee cup full of sunflower seeds, and sat on the cement and waited for them to dig into the seeds. I was less than a foot away from these little guys! The grapes didn't go over as big as the sunflower seeds did; they stuffed their cheeks full and took off! Enjoy your weekend, everyone! 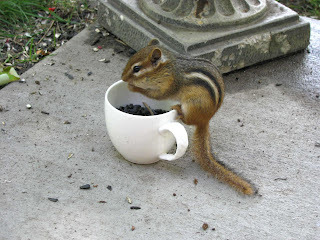 Good Monday morning, everyone! 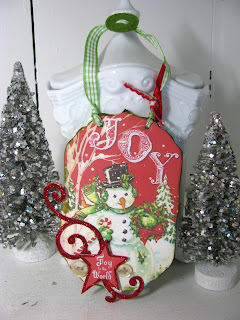 Today is posting day for our Crafty Secrets Design team challenge this month! This month, we were challenged to do a tutorial for you on anything we wanted! I've been stressing about this project all week, because I feel like I've done everything there is to do, tutorial-wise (plus my mojo has been MIA)! So it surprised me when I locked myself in my stamp room yesterday and I was able to come up with this kid's school photo album, that holds the mini-wallet size school friend photos. 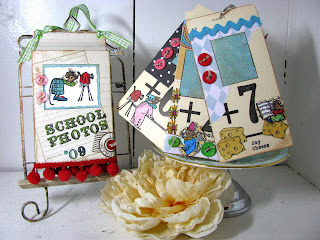 I had a box of school flash cards sitting on my desk, that my sweet friend Bevie Barton had sent me, so I decided to do a flash card photo album with Crafty's new Mice Party stamp set, based on the little photographer mouse in this set! 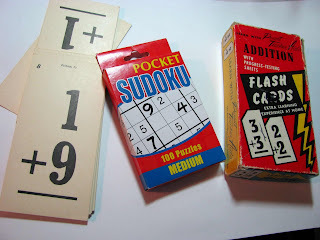 I tend to save odd-shaped boxes, just in case I can alter them in some way, and it was a serendipitous coincidence that the flashcards fit perfectly in these sudoko puzzle boxes that I had in my cupboard from last xmas. Aren't these the coolest flashcards? Bevie Pearl works in a school, and I was tickled pink when she sent me these for my birthday in March! See Bevie, I do get around to using stuff eventually! It just took me a while! 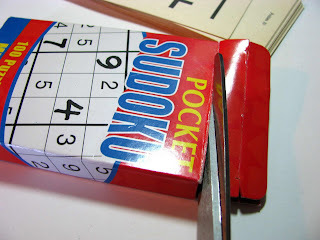 The sudoku box was so easy to alter; first, I cut the top flap & the side flaps off of the top of the box, leaving the bottom flap of the box intact. 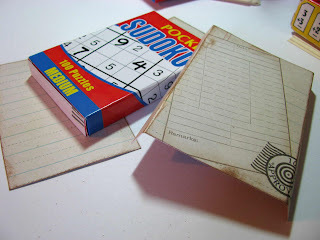 Then I cut some memo/library card patterned paper to fit the box; this school-themed paper is from Crafty's "Earthy" Paper pad. Since the paper didn't fit completely around the box, I cut a separate piece to go on the backside of the box. I measured the front of the box, and then marked the 2 spots on the paper where I'd need to score it to make a crisp corner. 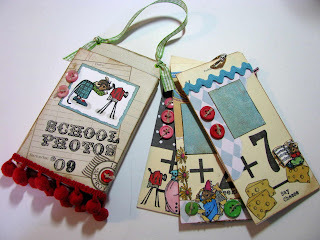 I then stamped "School Photos '09" on the front, and then used a glue stick to adhere the paper to the box front. I set about decorating each of the flash cards. I cut 6 mats for our little wallet-sized kid photos, and used these as my focal point so that when the kiddos trade photos at school, all you have to do is glue the photo onto the mat. 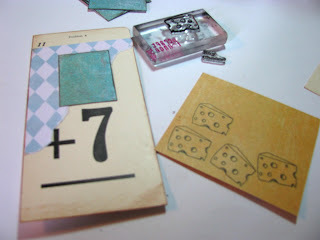 I also had some gold-yellow patterned scrap paper from the earthy pad that I thought would work great for cheese, so I stamped a bunch of cheese wedges on it and cut them out to use on the pages. 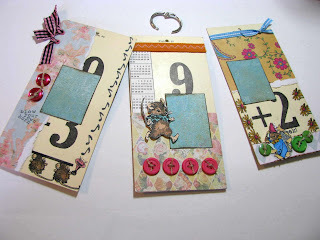 I stamped mice and cameras, and the sentiment "Say cheese" over everything, and then added buttons and rickrack as I putzed along. 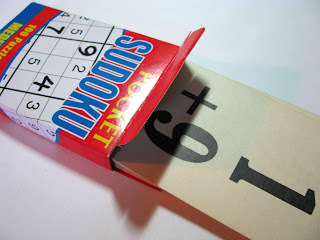 After I finished the flashcards, I worked on the front of the box. I stamped a photographer mouse scene, and used a Spellbinders deckle-edged nestabilities rectangle die to cut the image out for the front of the box. I stamped "School Photos" with Crafty's "Top Hat" alphabet set, and then colored in the letters & the scene with copic markers. The other talented design team chickies will all have fun tutorials on their blogs today, so make sure to stop by and check them out! Have a great week, everyone! L.